The Escritura – Spanish for Title Deeds – is one of the most important documents used in the Spanish property conveyancing process, as it everywhere that recognises private property. 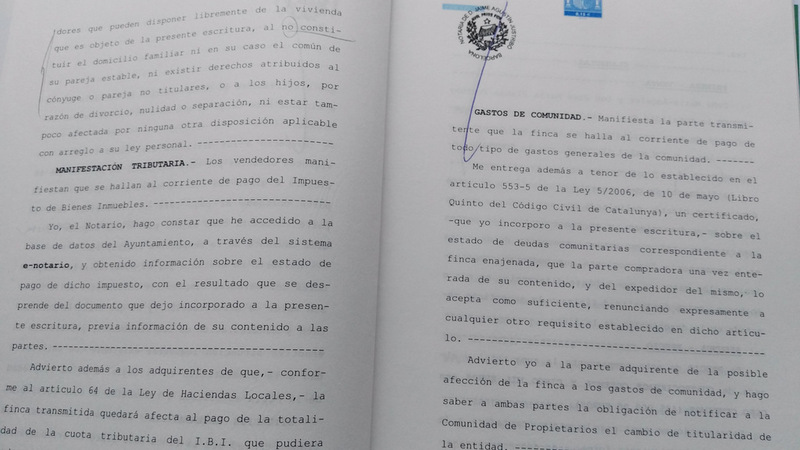 This FAQ by lawyer Raymundo Larraín Nesbitt answers all your questions about the escritura / title deeds in Spain. ‘Escritura’ is a generic term. In this FAQ it is understood as the Title deed to a property. 1. What information does it contain? i) Certificate of the Community of Owners stating the property is debt-free and up-to-date with its communal payments. 2. Is the information always accurate? What do I do if the information is not correct? Yes, it normally is accurate. You contact your lawyer to sort it out. A Title deed is a public document that certifies the change of legal ownership. Once the Notary signs it, it will then be used to lodge it at the land registry to change the ownership details. The seller, the buyer, the lawyers involved, the translator and the Notary. 5. Where is it kept / stored? It is kept at the Notary before whom it was signed. 6. Is it possible to get a copy in English, or do I have to arrange my own translation? Not possible. You will need to arrange your own translation. 7. Are copies legally accepted documents, or do you have to have the original? Copies are not legally accepted documents. They are not signed or sealed. There is no ‘original’. The copy that is handed to you at completion is not an ‘original’. You can lose it and it will not matter. You can always request more copies. A legally accepted document is the ‘copia autorizada’ which is signed and sealed by the Notary himself. 8. I’ve lost my copy, how do I get a new copy? You can request it from the Notary before whom it was signed. It may take several days. 9. I want to get the escritura for a property I am interested in. How do I go about it? Unless you have a legitimate interest you cannot. Only the vendor, or his lawyer, can supply you with a copy. In many autonomous communities in Spain it mandatory for real estate agencies to store copies of title deeds for properties in their books. So if you are interested in a copy they should be able to provide you with one. 10. Where do I get a copy from? From the Notary before whom it was signed. 11. What information do I need to obtain a copy? With a copy of your passport or NIE number it is sufficient. 12. How long does it take to get a copy? A simple copy (‘copia simple’) a couple of days at most. A ‘copia autorizada’ (signed and sealed by the Notary himself) may take longer. It has no fixed cost. The price will vary according to a number of elements such as the number of pages. On average €40 to €50 (£30 to £40). 14. Can I get request a copy online? 15. If not, what information about a property can I get online? You need to request a nota simple from the Land Registry which is a different document altogether. Please see my Nota Simple Explained FAQ. 2013 © Raymundo Larraín Nesbitt, All rights reserved.